Welcome to the information page for info booths here at Cecil Con 2019. Below is information about participating at our convention. Info Booths are FREE to those individuals/organizations that wish to promote their convention/event/organization/game/etc. by sharing information. This type of space is NOT for selling merchandise. Applications are ONLINE ONLY this year. Please read through everything before applying and don’t hesitate to contact us to ask any questions that may not already be addressed below. Vendors must set up their space or table by 10am on April 13th. The Vendor Alley is ONLY OPEN SATURDAY from 10-6pm. The Artist Alley/Vendor’s Hall is located inside of the Phys Ed building, first floor, in the gym. To access the unloading area, drive to the rear of the Phys Ed building. 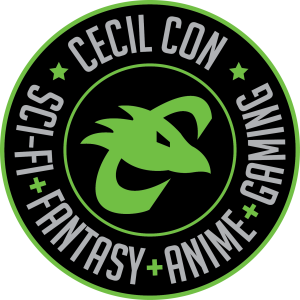 Cecil Con associates are available to help you unload; let them know if you have a small or large setup.